Basics of management-intensive grazing (MiG) as coined by Jim Gerrish. Although, Mr Pratt’s focus is often on finance and economics, here he explains simply one aspect of how to manage pastures for regenerative and profitable ranching. Nearly here – weekly shabbat – so thankful our Creator made such for us. Of all the 10 commandments, the fourth one is relatively easy to keep (remember) in our culture. I’m tired! Lack of sleep from allergies and just the constant fighting it makes my body exhausted all the time. Keeps me from being productive to be sure. Eleven cows of the seventeen selected have been recorded in standing heat as of 6pm today. There are a more who are shoving and being restless, so they will likely come in sometime before tomorrow. Other than going to town to pickup kleenexes, drop of some papers at NRCS, swing by the bank for a quick visit with Tom Morris about his grandparents being the last caretakers of the Linn County Rest Home, located just a mile west of Linneus on Infirmary Hill, then to Twin Oaks Produce for a handful of groceries. Had a nice visit with Fran Graff, whose daughter is also teaching in Dubai, though at a different school than our daughter. Rick continues to take care of my cows on the farm north and west of Purdin – It will another month before I can stay outside for more than a few minutes at a time. Will my cows forget me!? This is more water than mud, but I think you get the picture. (“Get the picture” get it? 😉 Ha ha I’m so funny. There’s one thing that I should say straight off the bat. I have never thought of myself as having a mental disorder or a syndrome. When I was still in grade school (I would be home schooled from the third grade and beyond), I was a quiet lad, never asking questions unless asked and rarely talking to my classmates; just sitting quietly listening to the chatter going on around me. Rarely, if ever, injecting anything into the conversation. Conversations especially were and still are difficult for me. Whenever I tried to start a conversation, I am reminded of wading through mud. Every topic, every sentence, every word was a trial and effort. Sometimes I would just get so tired of trudging through the mud that I just have to rest, but I keep wading through the mud until I can find a dry and solid ground on which I can rest and enjoy the peace that comes from being out and away from the mud. After a while, once rested enough, I might feel like wading through all the mud again and so I’d go back in to the mud, but the mud feels thicker than before and thus harder to wade through and then after awhile I get back out and rest and, after a time, the rests get longer and the wading gets shorter until finally I stop going back into the mud. Then I rest for the night and I’m ready to start the cycle again. But sometimes clogging through the mud gets to be too much. Instead of going through the mud, I stay on my little dry patch, even if I don’t particularly like it, it’s still better than fighting through the mud day after day just to interact with other people. So I stay on my dry patch of ground that I don’t particularly like and I just stand still. Sometimes, I work off the will to venture off your little island because I’ve become lonely or my little island has gotten too little and I just want to stretch my legs a bit. 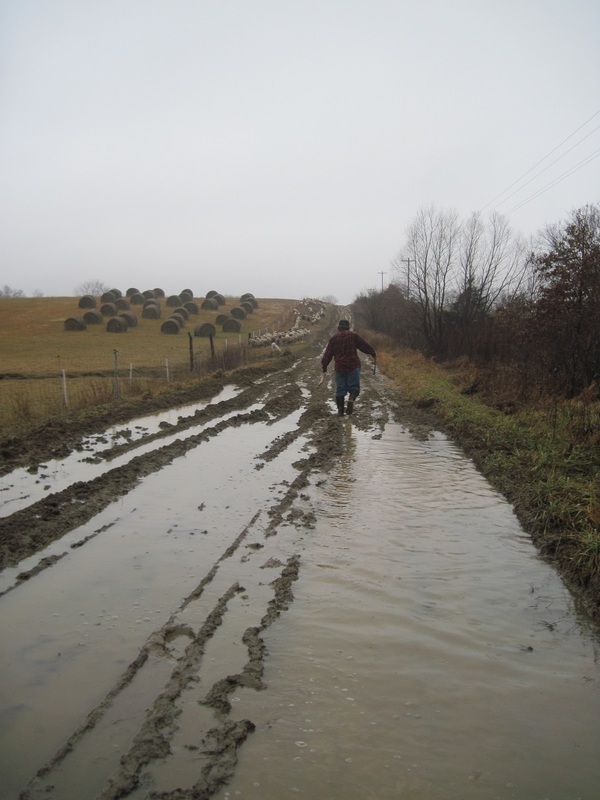 I find the mud is easier to walk through than I remember and I start taking more trips through the mud to interact with people and so, I slowly begin to take part of the world again. Next 3 day replication started morning of 5 Jun 2015 with Dallas moving poultry netting to fresh pasture before letting the chooks out of their tiny eggmobile. Day 1 egg collection – 7 eggs. Day 2 egg collections: 7 eggs. Day 3 egg collections: 7 eggs. We’ve continued with one pound of the wheat screenings cleanout, but that is really not enough for them since they are eating it all and still seem like they want more. However, for the next replication, we will continue with one pound and increase it after the grazing trial. More and better quality in this paddock with up to 65% red clover and a good deal of plantains, although both are more mature than what chickens usually desire, they’ll still hammer it pretty good. Lovely thick forage in same sized paddock of .039 of an acre. Estimating 300 lbs of forage per inch with 8 inches available for 2400 lbs/acre times .039 for 93.6 lbs in the paddock. We have discovered that this size paddock with this much forage results in far too much trampling of quality forage and not enough eating. Now that we are getting an idea of how much chooks eat in a day, we can determine how many chooks can be managed in smaller, more easily handled housing. A full length 164 foot poultry netting fence is too much work for only 14 hens eating .75 lb of grass per day. In other words, to be more cost effective, the 41′ by 41′ enclosure allowed with a poultry netting should allow about 41 hens, of course depending on forage quantity and quality. This would include realising that the taller forages would be unavailable for chooks to eat. We realise that, by the book, chooks typically eat only 4 ounces of feed per day. However, i think that is a purely grain diet which would be more dense than grass, legumes, and forbes. Probably, most of what is being utilised, however, is actually scratching and trampling. Nevertheless, this needs to be considered to keep a healthy sward.